The Yemeni Jewish remnants have triggered so much interest on the part of so many western governments and humanitarian organizations, to an extent that is quite rare. The story of the Yemeni Jewish remnants is distinct from that of their brethren who emigrated to Israel during Operation Magic Carpet (1949-51). Before and during Operation Magic Carpet, Yemeni Jews came on their own in overwhelming numbers, many of them on foot, undeterred by the prospects of the trials and tribulations which they knew would await them in the course of their travels. In contrast, the Yemeni Jewish remnants displayed a strong hesitation, if not reluctance, to leave Yemen. 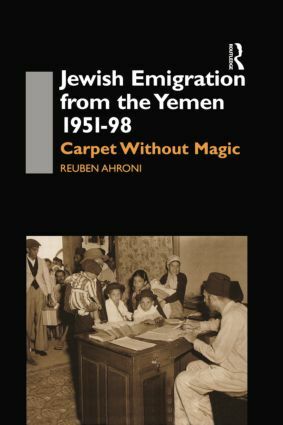 Thus, since Operation Magic Carpet and until 1962 - the year of the coup d'état eliminating the autocratic Imamic regime in Yemen and the closing of the Yemeni gates for Jewish emigration - only some four hundred Yemeni Jews heeded the call to emigrate to Israel. It is for this reason that the book is subtitled Carpet Without Magic. A 'red carpet' was indeed spread before the Yemeni Jewish remnants, but the 'magic' was no longer there.